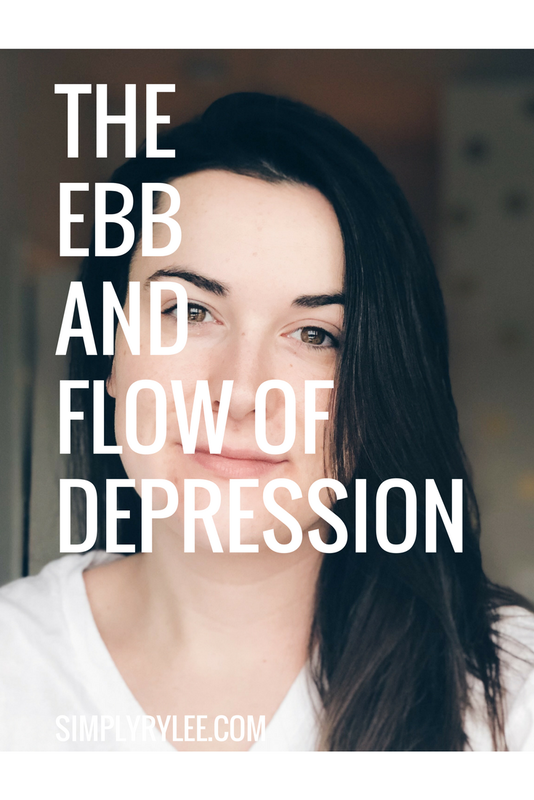 Talking about the ebb and flow of depression is really weird, and pretty difficult. In part I think it is obvious why, right? Because some days are easier than others. Some days are downright hard. And on a day when the fog just is not lifting, and it isn't even like you want to cry, but you just feel like you are in pain because you exist - that's not a day that I can talk about it. I do think though, that explaining that the flip side of that coin isn't a happy go-lucky girl with no cares in the world, is important. There are good days of depression. But that really means that I get out of bed a little easier, don't cry before say 10 PM, and eat three regular meals without anxiety. A good day of depression is going to the gym, or yoga, and not crying about my fears or my inadequacies or my constant desire to be alone in my warm bed. A good day of depression is eating breakfast, and just being okay with it. A good day of depression is putting on a little makeup, because I want to. On those days, I still feel like there is a gaping hole in my chest. On those days, I still feel like there is an entire second me that has to operate and get through the day. On those days, I still get painfully lonely. I still cry. I still struggle to make sure that I do the things that I am supposed to do, the things that make me happy, the things that keep me healthy. But on those days, there is a little less weight on my heart. There is a little more clarity. For what it's worth - there's no real timeline to this either. I'm not sure if I've ever explained that. But I think it is mostly clear to you all this is not about a broken heart, or the end of a relationship, or even about cold weather. Have those things made me sad? Sure. But that's not depression. Just because I'm somewhat stable as a single girl again, doesn't mean I don't have depression. Just because the sun has been out for the last three days, doesn't mean I don't have depression. There doesn't have to be a reason for a depressive episode. And there isn't ever a hard and fast end date. Because here's the kicker, it is going to come when it comes, and go when it goes. So there it is, the ebb and the flow. Some days I feel like I am going to be on my own for the rest of my life. And some days I laugh and go for long runs, and it for a while, it is like my brain isn't attacking my body. Those days, sometimes, like right now, come in little bursts. Little 48 or 72 bursts of goodness. And sometimes it's 9 bad days in a row and you run away to Chicago to catch your breath and remember what genuine freakin joy feels like. I'm including the treadmill workout I did the other night here, because let me tell you, it was so much easier and more enjoyable than I thought it would be. And y'all deserver a run like that to. Rest for 2 minutes (I jogged at 5.5 MPH) Repeat 4 times. Also you should totally modify based on your own speed. I'm slow. And frankly, that's because that is where I am comfortable. And it is what makes me a happy runner. But! If you're fast, be fast!